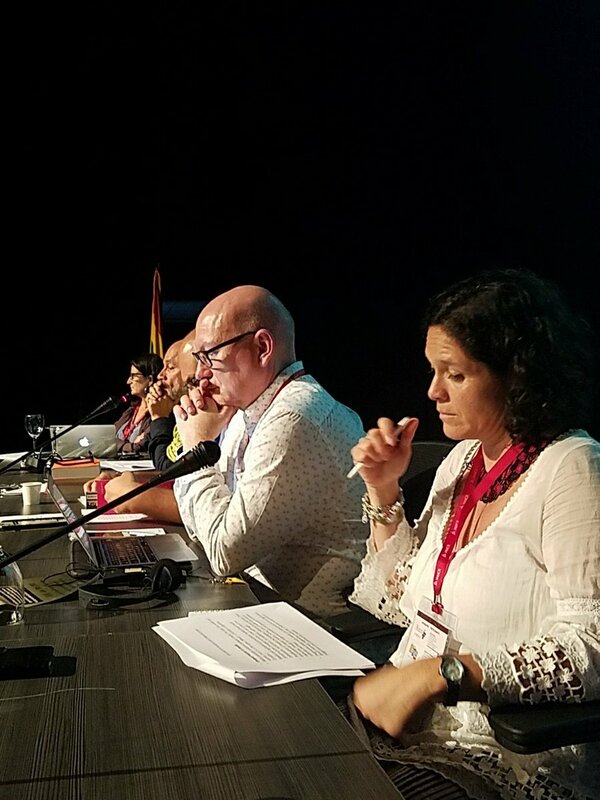 CFMS was recently represented by five scholars at the International Association of Media and Communication Research (IAMCR) conference in Cartagena, Colombia, on "Transforming Culture, Politics and Communication: New media, new territories, and new discourses". Associate Professor Tanja Bosch, Dr Wallace Chuma, HoD Professor Herman Wasserman, PhD student Willemien Calitz and Master's student Rozanne Engel attended, presenting on a variety of topics including fake news, peace journalism, journalism and conflict, China-Africa and the media and female filmmakers in the South African context. "IAMCR 2017 in Cartagena, Colombia was the first International Association of Media and Communication Research conference that I’d attended. I was stunned by the diversity in nationality, ethnicity, race and backgrounds of the conference attendees, and similarly astonished by the wide variety of topics currently being researched in the communication field. Research on social movements beyond the Western context has easily been simplified or decontextualized, which is why IAMCR’s topic choice of transformation provided such insightful perspectives. The interconnectivity and similarities, yet stark differences, between what nations or groups experience regarding social movements was presented to me in a new light. As an emerging scholar that aims to conduct inter-disciplinary research, I found the panels on sustainability most useful to my own study. I felt at home discussing ideas around climate change communication, and found affirmation that there is a need for more robust research concerning issues of sustainability. My own study focuses partly on the representation of China’s sustainable development, and the discussions and debates in the panels I attended contributed to the approach I want to take with my study. I learned a lot about the differences between coverage of issues such as climate change vs environmental issues and in developed vs developing nations. The consideration of sustainable development being a political, yet technical, yet ideological issue, had me thinking a lot about the frameworks both China and South Africa work within. Even though China is categorised as a developing nation, the similarities to power distribution by the developed world across Africa is becoming clearer, and yet more complex. South Africa’s role in that power distribution is also becoming more complex, and accordingly, coverage of and journalistic engagement with China. Furthermore, I gained insight from concepts such as blurring the lines between journalism and activism when it comes to the coverage of climate change. Again, I could relate this to my research since many of my interviewees are already in that position. Yet, the particular study focused mainly on journalists’ own decision or agency in blurring the distinction between activism and journalism, whereas my study tries to factor in the other influences that contribute to this type of coverage, such as news values, editors, funding and sources. Generally, I found the issue of journalistic education and training to come up quite strongly in the panels I attended, and the question of how to train journalists in changing media environments, local contexts and with a regard for sustainability really stuck with me. I also found that a lot of research is currently being done on diaspora communities, indicating the significance of globalisation and our interconnectivity, and the role that different types of media can play to facilitate that. That interested me from the perspective of what kind of news media Chinese diaspora use across the world – and how that shapes their own views on China’s sustainable development and human rights reputation. Unfortunately, I found few panels containing research on the China-Africa engagement, or on the theory of soft power, and I would have loved to have more perspectives and exposure to theoretical frameworks regarding this topic. I know that one or two presenters couldn’t make it and that this topic was part of their focus. I also missed a strong presence of sexuality/queer studies in the developing world, which I’d have loved to compare with the South African context. In the heat and humidity of the gorgeous city of Cartagena, I met an incredibly inspiring amount of academic individuals, and most of our ideas were better formulated in one on one conversations – such as the ones I had with my former master’s supervisor Christopher Chavez, and one with Lisa Mclaughlin, that I had met at my hotel. It was also significant to meet with Janet Wasko and Julianne Newton again, interact with my supervisor Herman Wasserman, and finally, to meet three strong female SA researchers on the journey back to South Africa. We managed to discuss our challenges at our individual universities and I hope we will continue to be a source of support for each other. Similarly, I hope to keep receiving support from the Emerging Scholars Network - a really wonderful part of IAMCR that prioritises new and developing researchers. Finally, the conference was well organised, in terms of language and infrastructure barriers, I enjoyed the creative solutions such as the boxes that formed the Salas in the Barahones. I hope to attend again, and I hope to build new and stronger connections with scholars every year. Particularly considering the fact that I am currently at the analysis phase of my PhD which is a challenging sphere to move through, and I find that conferences such as these give me purpose, solidarity, and also just generally motivation to move forward." Visit the IAMCR Cartagena conference site to read the abstracts and research topics of researchers across the globe.